Water a Los Osos sewer contractor is dumping into Morro Bay. Every three days, contractor W.A. Rasic dumps more water into Morro Bay than an Olympic-size pool can hold. It’s part of the Los Osos Wastewater Project, putting in a sewer system for the area. As workers dig trenches for the sewers, groundwater rises to fill them. The water has to be removed for work to continue, and Rasic is responsible for getting rid of the water. 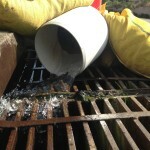 Rasic takes the water and dumps it into storm drains that lead to Morro Bay. But, where that water has been going has drawn criticism from the Los Osos Community Services District (LOCSD) and Central Coast Regional Water Quality Control Board. Both have said that the water should not be dumped in the bay. Instead, the water, which could be drinkable with only minor treatment, should be allowed to filter back into the Los Osos aquifer. “It’s unfortunate the county didn’t plan well enough in advance to use the water in some beneficial way,” said longtime Los Osos resident Jeff Edwards. The dumping of the water into the bay comes amid a major water shortage in Los Osos. Aside from light drizzle Saturday, it hasn’t rained in Los Osos since spring. Since 2007, the county has reported the supply of water in the Los Osos Groundwater Basin to be of Level III severity. Level III is the most severe shortage in the county’s Resource Management System. In a 10-year span between 2002 and 2012, water usage in Los Osos declined by approximately 40 percent, according to the county’s 2013 resource management report. The Central Coast Regional Water Quality Control Board directed the county not to discharge to the bay without first exhausting all land discharge options and gaining approval from the water board. “The county may discharge to Morro Bay only after the Central Coast Water Board agrees that land disposal options are infeasible,” water board director Kenneth Harris wrote in an August 7 letter to the county public works department. But, Rasic began discharging water to the bay in early August without approval from the board and prior to the completion of a network of pipes that would transport the water to a leach field, where it could soak back into the aquifer. Water board staff member David LaCaro confirmed with CalCoastNews last week that the board never gave the county approval to discharge to the bay. “There hasn’t been any formal letter agreeing to the discharge,” LaCaro said. As Rasic continues to discharge to the bay, the county still has not completed construction of piping to the 8-acre Broderson leach field, which is expected to serve as a discharge location for recycled water when the sewer is operational. LaCaro said poor planning on the part of the county accounts for the dewatering beginning prior to the completion of the piping. “For the most part, it was an ill conceived plan, and we weren’t privy to their construction scheduling,” LaCaro said. Two weeks prior to the beginning of the dewatering, Rasic submitted a plan to the water board that listed pumping into Morro Bay as “Option 1” among four proposals for discharging the water. The plan also stated that Rasic would only pipe the water to Broderson, or another basin, if it did not pass environmental quality tests. In addition to the water board, the LOCSD Board of Directors has likewise criticized the county for not completing the piping to Broderson prior to beginning the dewatering project. “The fact that the Broderson facility/infrastructure is not available for discharge is a planning issue and not a viable excuse for water surface discharge,” wrote LOCSD Board President Leonard Moothart in a September 11 letter to the water board. In the letter, Moothart requested that the water board stop all discharge to the bay and order the county to expedite completion of the Broderson field in order to discharge to land. The LOCSD also suggested using county owned drainage percolation basins as alternative land discharge locations and, if necessary, trucking the water to the basins. At last week’s Board of Supervisors meeting, County Supervisor Bruce Gibson, who represents Los Osos, and Public Works Director Paavo Ogren criticized the LOCSD board for suggesting alternatives to discharging to the bay. Ogren said that trucking water would cause considerable traffic and pollution. He also said dewatering of trenches must occur in order to lay the piping to Broderson. But, Ogren did not say what is taking so long to do so. Neither Ogren, nor Gibson responded to CalCoastNews emails asking why the piping is not complete and why the contractor is discharging to the bay. LaCaro said cost, as well as timing and power usage, factor into the county’s decision to discharge to the bay. From the beginning of August through early September, Rasic dumped approximately 250,000 gallons of water a day that it pumped out of the ground in Los Osos, according to self-reported figures. In comparison, an Olympic-sized pool holds 660,000 gallons of water. For every three days of its first month of dewatering, Rasic, on average, dumped more water into Morro Bay than Olympic-sized pool could hold. As construction speeds up and rainy season begins begins, the amount discharged will likely increase. County dewatering plans have discussed the possibility that Rasic could pump 8 million gallons per day. In compliance with its project permit, Rasic ordered laboratory tests of the water it is pumping into Morro Bay. Environmental analysis firm Fruit Growers Laboratory conducted the tests and determined that the water being pumped only needs minor treatment to achieve drinking level quality. LOCSD water rates put a price tag of $30,000 on 1 million gallons of water. Over the course of the dewatering project, the county could waste millions of dollars of water. If pumping increases to 1 million gallons a day, it will take a little more than a month to dump $1 million worth of water. Some public comment speakers at Board of Supervisors meetings have suggested that the county has approved dumping to the bay because it is cheaper than piping to basins and the wastewater project is costing more than expected. Observers of the dewatering project have also suggested the possibility of piping water aboveground to Broderson or to county or privately owned percolation basins. Aboveground pipes are currently in place on El Morro Avenue, where they connect several blocks of wells. LaCaro said the water board is still determining whether it is actually not feasible for the contractor to pump the water onto land. He also said the board is determining what, if any, water quality impacts the current method of discharge is creating. If regulators determine that the water discharge to the bay is harming the ecosystem of the Morro Bay National Estuary, the county could face hefty fines. Racic’s water dumping of significant amounts of water, instead of “recycling” it into the aquifer, is going to be costly for Los Osos, both immediately and in the future. Here is just one example in which Paavo’s little sweet deal with Rasic to allow illegal dumping into the bay will end up biting Los Osos water customers in the kiester. The Water Conservation Implementation Plan For the Los Osos Wastewater Project (http://www.slocounty.ca.gov/Assets/PW/LOWWP/document+library/Revised+Final+Draft+WCIP.pdf), calls for a goal of a reduction to water usage no more than 50 gallons-per-day per person. There are 5000 residences in the Wastewater Service Area. Assuming Rasic’s estimations of amounts of water dumped are correct, up through September he dumped about 250,000 per day. That is the equivalent of the the 50 gallons-per-day water usage restriction, to be allowed per person, for 5,000 people for one day! That is water that should be counted both towards the water-conservation efforts required in the Wastewater Service Area, and the water-conservation requirements by the “20×2020 Program,” a State program which requires 20% reduction in water use by the year 2020. The cudgel the State uses to enforce compliance in the 20×2020 Program is this: if a water purveyor does not demonstrate the 20% reduction in water consumption by its customers, the water purveyor will get NO state funds. NONE. No grants. Nada. That water being dumped needs to be metered and reported because it will count towards water conservation efforts in the future. It will ease the peoples’ burden of water conservation measures. This dumped water could be recycled right now, and, if metered, can be used to decrease the amount of water required to be conserved by the 20×2020 Program. Going back to a reply to Mary and talking about parts per million, I am reminded of a news article. Back in the nineties (can’t remember exact) a train or truck, had an accident and dumped chemicals into a river in Northern Ca. At the time everyone was up in arms that it was ruined for many years to come. So then a few years later, scientists where STUNNED when they went to do water test follow ups and couldn’t find even trace amounts. Yep Mother Nature stepped in and cleaned up. Now don’t flame me with comments about Ohio rivers etc. I’m not saying this is the case always but in this case yes diluted down. Again this is a true story and happened in N. Ca. sometime in nineties. So true, yet you cannot name the place, or time, or event. One would think such a remarkable thing to happen would be on the record….maybe even try Googling it? On July 14, 1991, a train tanker car derailed in northern California, spilling 19,000 gallons of the soil fumigant metamsodium (sodium methyldithiocarbamate) into the Sacramento River north of Redding (actually, Dunsmuir). On August 6, Shasta County health officials notified the California Department of Health Services (CDHS) of an outbreak of dermatitis among Shasta County jail inmates and crew leaders who had assisted in removing dead fish from the river on July 21-22 in greater than 100 F (greater than 38 C) ambient temperature. To determine whether the outbreak was related to the chemical spill, during August 12-14, CDC and the CDHS conducted a retrospective cohort study of 42 inmates and crew leaders who participated in the cleanup and 48 state and federal employees who also worked in the river July 21-22. Dermatitis was defined as a self-reported rash on the feet or ankles with onset July 21-August 11 and duration of at least 4 days. Of the 42 inmates and crew leaders, 27 (64%) had dermatitis; none of the 48 state and federal workers interviewed reported dermatitis. Onset of rash was noted 0-18 days after exposure in the river, peaking at 3-4 days (Figure 2). Rash affected the ankles (89%), feet (74%), legs (56%), hands (15%), and arms (11%). Reported symptoms included redness (96%); itching (81%); scaling (78%); bumpiness (56%); pain, burning, or stinging (37%); warmth (30%); and blistering (26%). Rash occurred among 25 (76%) of 33 inmates and crew leaders to at least 12 week to complete treatment. 12 weeks is 3 months. That is a long time to recover from a “simple” rash. So, your claims about “nothing” happening to the clean-up crews is a bit of an exaggeration. Okay, so I’m all for technology and accommodating mankind and I realize that this is important work. The reason it is important is to protect the natural resource of the bay. Our “2,300 acre estuary is home to a working fishing fleet and recreational boaters. Morro Bay provides important habitat for birds, fish and other animals. It is a vital stop for migrating birds on the Pacific Flyway. Sheltering pools and eelgrass beds provide nursery habitat for fish and invertebrates. Now, that being said, indiscriminately dumping millions of gallons of construction waste into this watershed will not do. This water is of variable quality and oxygen content and, basically, it does not belong there. Contaminants carried into the bay, heavy metals, silica, and salinity alterations in the delicate estuary are all serious concerns. The whole point of protecting nature and preserving our environment is that we don’t do harm. This is harmful. There are many places that can use this water or it could be returned to the aquifer, where it belongs. Man should not be so lazy as to impact nature needlessly, without consideration, or without restraint. We are just tenants here for a short while. Plans for this most obvious outcome from construction should have been in place. Since they weren’t, lets make some now. I have to ask who would give this note a thumbs down. Why? Should we just plod on and destroy everything natural; nuke and pave? I lived in Western PA in the early 90’s. NONE of the lakes were clean; all of them had signs prohibiting swimming. Sewer bills there are $200 to $500 per quarter and rising. Once the impact of the $3 Billion hits, I fully expect that they will go up 5 to 10 times. Thumbs down = you don’t care or perhaps money means nothing. I am guessing the people who would vote it down are people who have a vested interest in getting it done as quickly as possible, people who aren’t aware of the issues with dumping of wastewater into the ocean, or people who want to kiss up to the politicians who stand to benefit if the politicians behind this dumping benefit. What a REWRITE of what is going on. Millions of gallons of construction waste? The MAJORITY is water!! Nice spin. And you wonder in your reply why all the down arrows. Maybe others get what you don’t?? Right on target BeenThereDoneThat, thank you. 1. The majority of polluted water IS water. It doesn’t take much in the way of contaminants (depending on the contaminants) to make the water unfit for dumping in the ocean. 2. It is illegal to dump water from construction sites into the ocean without permits from appropriate agencies. 3. The water board has not issued a permit to W.A. Rasic to dump water into the bay. 4. One sample of water has been done. That represents a snapshot of the water quality from one place at one instant in time. As the construction progresses, different areas of groundwater will be accessed. The quality, and the contaminants, can change from place to place, especially since it is relatively shallow groundwater that is being dumped. Shallow water from a construction site is subject to contamination from surface pollution; it has not had the time to move through the aquifer to a sufficient depth to “clean” the water. THEREFORE, we don’t know what kind of pollutants W.A. Rasic is ILLEGALLY dumping into the bay. W.A. Rasic needs to be investigated by the water board, and his contracted work must be stopped until it can be determined what damage has been done, and what laws and regulations have been broken, by his unpermitted dumping of construction water into the bay. Mary, if it is millions of gallons, should we first get into the fact, that depending on amount put in, there is something in the equation called parts per million. If you look at a water report of a city like Paso in which I reside, there are many things in the water that can be hazardous at higher levels but if under (I.e. within guidelines) set limits of parts per million, it is considered diluted. So the next time it rains in Los Osos, and yards that have runoff go into the gutter and oil on roads and parking lots run to gutter, where do you think that all ends up?? Last here is the part that is hilarious with all you with your arms in the air. First you are upset that it is contaminated, then in the next breath you say we need to recover it. So you want to drink contaminated water? You guys are contradicting yourselves. The points in my post are valid. In my post, I said nothing (positive or negative) about recovering water. THAT is something you made up. First, understand that this is not a simple issue. So, really, you are NOT “Right On Target” BeenThereDoneThat. But, but, but, Taxme here is the thing. You are talking solvents, this and that. My point is, think about the fact that he most likely isn’t adding anything. All they are doing is digging ditches. We aren’t Fracking here, so should be no chemicals. So they may wash down street around the ditch. What is on that street and could have come from an adjacent yard or drive, is most likely washing in anyway when it rains and runs off to the ocean. So again for all you chicken littles and the sky is falling TELL ME PLEASE, what realistically (not reading off all the stuff from your local nursery) could be on that street, that wasn’t already there even before this project? Thanks BeenThere, I agree he’s not adding things, but we are moving things around. Not stuff from the street, but water, fertilizer, weed killer, chlorine, bug poison, household hazardous waste and such from just below the yards of these people and then into the bay. I guess my issue is that a) it’s all unknown at this point and b) they never even had it thought out or permitted. Just manage, test, and monitor it and you are more than welcome to waste your water. Seems like a huge waste, however. Tax, on the water waste, like I said in a different reply here, if long term, then yes find a way to recover but this will be about two years, roughly, that he may be dumping. By the time you go through the review obstacles we call Government, it will add probably five plus years to the project. So yea it might be wasteful but on the practical side, again, I say let’s just move on and get the Los Osos sewer in and done once and for all. In addition, the water that is leaching out from the surface will have higher concentrations of some of the contaminants. Contaminants that contain more easily-vaporized contents will vaporize off some of the product. In addition, contaminated water that has been previously in the soil will have lost some-to-much of the water portion due to evaporation. I really don’t think the EPA will sit still for 2 years of this negligent contractor polluting the bay just because he wants to squeeze a little more profit out of the deal. Deposits of lead and other heavy-metals (such as cadmium) have made soil near roads toxic to the point where it is recommended that people not grow food in the soil. The lead comes from car exhaust. There are other sources of fun for kids besides Disneyland, just like there are other sources of illegal contaminants in water outside of the fracking industry. It takes a very little bit of some pollutants and materials to contaminate water. Sediment, fertilizer run-off and gas and oil products run-off (which has settled into the surface layers of the soil) are known pollutants that damage estuary and ocean ecosystems. Why did the LOCSD not get the other two water companies to join with them in writing the letter? They are tied together in an adjudication which is still in the courts. To be effective, as they all draw water from the basin, this should have been a joint letter. CalCoast forgot to ask if a formal letter from the RWQCB was necessary to allow the discharge. What an absurd comment. Anybody can report illegal dumping. From an outsider looking in, this looks like another effort to throw logs in the sewer project pathway, rather than any real concern about some construction related water. I would very much like for the LO project to be finished, but not at the expense of the bay ecosystem. W.A. Rasic did not get permission to dump water into the bay. I cannot imagine the water board giving the company such permission because of the varying quality of “construction water,” which depends on the nature of the surface pollution which has not yet had time to move through the aquifer. HE DID IT ILLEGALLY. Game over. Until an investigation is completed by the water board, W.A. Rasic must be made to stop work. Yes, it will be an inconvenience. However, allowing any yahoo construction company to illegally dump construction wastewater cannot be tolerated. Stopping W.A. Rasic’s work until the investigation is over and, if appropriate, issuing fines to W.A. Rasic, will send a message to other construction companies who illegally dump water. It’s terribly ironic that those who for the last decade have opposed and or ignored statements, letters, warnings of enforcement actions regarding the continued use of septic tanks and the resulting pollution of the community and the estuary, that they should complain yet again about water that “nearly drinkable” being dumped in the bay. Talk about hypocrisy. “Nearly drinkable”? Let’s see you dip into the sediment- and surface-contaminant-filled “nearly drinkable” “construction water” and drink a nice big glass full.